Ratatouille. It's always seemed much too fancy for me to make. Too fussy...and too intimidating. Boy do I feel like a fool. Ratatouille is easy as pie and it's a straight up snazzy way to get in all those great veggies. I made it for a dinner with my dad and his better half and I thought dismally, "Oh surely they'll hate it. I'm sure it's no good." This was of course, before actually tasting it. How good could it be anyway? It's just some veggies and tomato puree, essentially. It all seemed terribly effortless. A fool. Again. This ratatouille is simple, delicious and downright lovely. 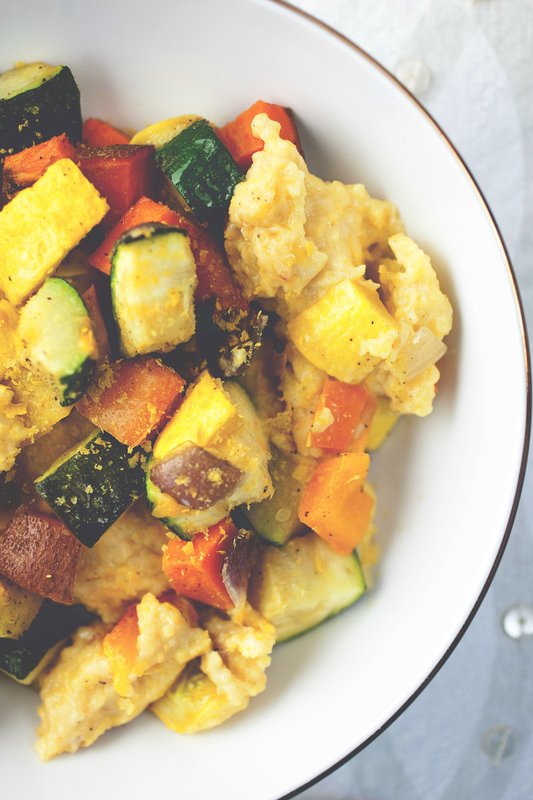 Roasted eggplant, zucchini, yellow summer squash, and red bell pepper all roasted to perfection and perched atop a cheesy, creamy bed of polenta. Start by pouring the tomato puree into a medium baking dish. Scatter the diced onion and garlic evenly on the bottom of the dish, on top of the puree. Atop that, evenly scatter the herbs, salt, pepper and red pepper flakes. Preheat oven to 375 F. Slice up all the vegetables into very thin disks. Then, starting with two disks of eggplant layer atop that, two disks of zucchini, two of the squash, and followed by one of the bell pepper. When layering, ensure only a small crescent of the bottom vegetable disk is showing. Repeat until all the vegetables are used up. The vegetables may have to be in stacked lines atop one another and that's okay. It doesn't have to be perfect. Drizzle the veggies with olive oil and a little dried herbs. Cover with a sheet of parchment paper and bake at 375 F for about 50 minutes, or until the sauce is bubbling up and the vegetables are cooked. Now, for the polenta. Bring the water and salt to boil over high heat. Add in the polenta and whisk vigorously, until it's thickened slightly. Then, turn down to low and cover. Every 10 minutes, stir vigorously scraping along the bottom and sides. Cook for about 40 minutes, or until it's smooth and thick. Remove from heat and stir in the nutritional yeast. Serve the ratatouille over the polenta. Drizzle with a little olive oil if you want!